(Bloomberg) -- Margrethe Vestager put herself forward for one of the European Union’s top jobs, a day after she cemented her reputation as the bloc’s tough antitrust enforcer by squeezing a $1.7 billion fine out of Google. “It’s long overdue to have a woman heading” the European Commission, she told reporters ahead of a meeting of the Alliance of Liberals and Democrats for Europe, the centrist party group that chose her as one of seven senior politicians to rally for votes in the European Parliament elections in May. The group is among mainstream parties seeking to fend off a populist surge fueled by anger against elites and economic inequality. The Dane has pitched herself as a campaigner for fairness in taxation and business. She has cracked down on corporate tax evasion by telling Apple Inc. to pay billions of euros of back taxes to Ireland. She’s battled Alphabet Inc. to call for fair treatment in Internet search results and phone apps from its Google business. Vestager’s popular profile got the loudest cheer from party supporters at a Brussels campaign launch on Wednesday as the 50-year-old was mobbed by people seeking selfies with her. She now needs to turn that fame into electoral success, calling “first things first” to get people out to vote in May and refusing to discuss her own job prospects in detail. There’s never been a female European Commission president. 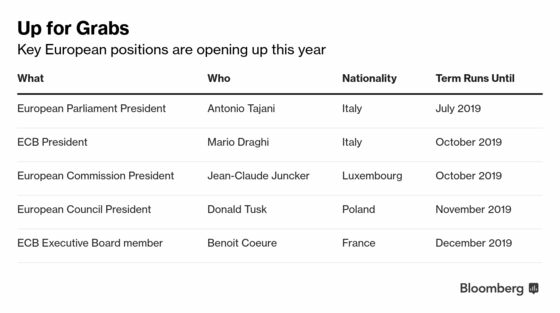 While her party is unlikely to win elections, it may make gains that could help it haggle for one of several EU senior positions. Her campaign is boosted by calls for more women in top jobs even though becoming commission president seems unlikely because she hasn’t been a prime minister, like previous holders of the job and like her fellow liberal candidate Guy Verhofstadt from Belgium. Vestager’s campaign echoes French President Emmanuel Macron in trying to put forward a positive pro-European message. Vestager capped her run as antitrust chief by bringing to 8.2 billion euros the total amount she’s fined Google in three investigations. She announced the fine over Google’s advertising contracts at a Wednesday press conference, indicating the company may be able to avoid further penalties since she doesn’t see problems with how it’s obeying orders to change its behavior. Vestager recently angered politicians in Germany and France by blocking plans by Siemens AG and Alstom SA to create a fearsome European rail giant to battle China. She stymied the deal over concerns it could increase prices for customers. Macron was notable in not joining criticism by other French officials of the EU’s stance. The other ALDE candidates are Verhofstadt, Italy’s Emma Bonino, Luis Garicano of Spain’s Ciudadanos, Germany’s Nicola Beer, Slovenia’s Violeta Bulc and Hungary’s Katalin Cseh.